The Aliens Legacy • View topic - Exhibition of original 'Aliens' props & costumes - October! Exhibition of original 'Aliens' props & costumes - October! Post subject: Exhibition of original 'Aliens' props & costumes - October! I've just been going through all of my archive and behind the scenes photos as well as I'll be playing a slide-show in the same room. There are 2224 images so far! That means that if I show each one for one second the loop will run at nearly 40 minutes! Eek! Here's a photo of a small selection of what's in the collection. Left to right: Gorman, Bishop, Drake (with replica Smartgun), Ferro, Spunkmeyer, Hudson. Oh, and I'm aware that I'm not posting this in the UKCM section, that's deliberate in that some folks don't read that section. Over the years the UK fan-base has changed a lot and while there are some old far... folks I know from way back I've not met a lot of you new folk so I'd like to extend an invitation for all involved to come along and say hello. I am hoping to be there.... Still got a few 'logistics' issues to sort out before I can confirm though. 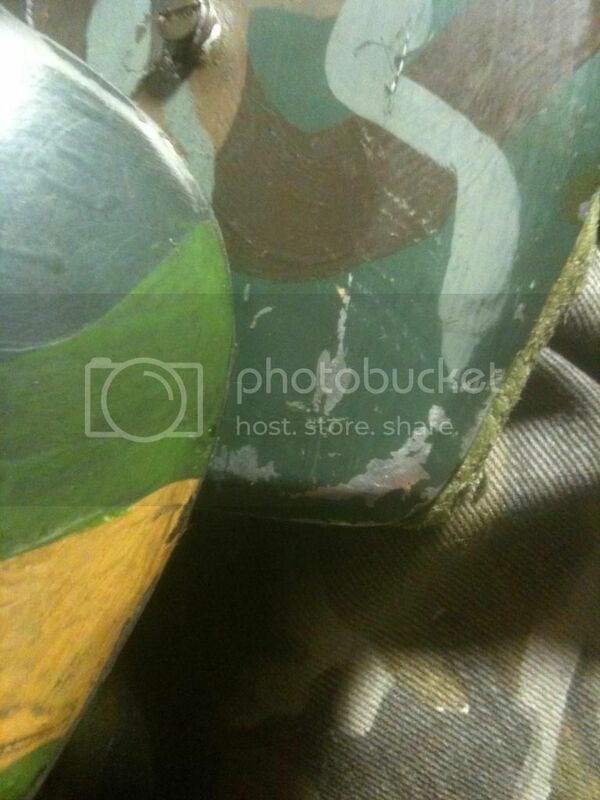 If anyone can get me a good pic of the green used on the armor in natural light while they're there, I'll kiss their feet! Been driving me insane for years now, and it would be great to finally have a definitive answer!! Thanks in advance! If I make it up there, I'll even take a picture of them against my Humbrol colour swatches at the same time! (If Harry will let me get close enough!). Saw the poster for this when I drove past the NSC on the way to Leeds. Sad that I'll not be in the UK to see this, any chance it might be a semi-regular thing? I'm currently trying to talk the wife into moving back to the UK for a couple of years ... we'll see on that one. Harry will you be taking your taxi up there ? (I'm the other Harry Harris). Bless you and the ground you walk upon!!! I cannot wait to see all the items! Seconded, that would be ace! Sadly no. I do hope that one day I can bring the collection over to Canada and the US (to Dragon Con and SDCC) so that you guys over the pond can see it in person but the cost of doing so is definitely beyond my means I'm afraid. Even UK event organisers are reluctant to have the collection on display as the space it takes up is potential dealer-table space that's lost, which means less money coming in on table hire charges. Events are very income driven these days and so collections like mine are very much a low priority, particularly as I'm not selling anything and therefore not contributing to the event financially. No doubt this is the case. Very said. What this means well see SDCC. Personally I think that fan tables and collector tables are a good reason to go to a Con. Cons like DragonCon, FedCon, NSC Alien Encounter …. Which sells tickets at the end, perhaps not enough. I guess it’s at the end like for the festivals the dealers count not the person only buying the ticket. Not that I’m against Merchandice. It should be "just a" not "THE only" part of a Con. Again thanks to Mr. Harris for showing his collection. For the german fans there is also a static exhibition in Frankfurt. Displayed is also an original alien costume. PLEASE...someone tell me we got some decent pics of the colors, or the aforementioned color swatch matching? We did take some good pictures. But I forgot my swatches, which was a real pain. I took some pictures next to some of my armour that I took up, so we can do a bit of colour comparison, so all wasn't lost. I have sent a set of my swatches to Harry for reference, but he's not going to be able to get to his screen used stuff until in the new year as it has all gone back in storage. I'll see if I can get my pictures up here. All the above taken under fluorescent lighting. These somewhat fly in the face of the Weirbowski armour pictures, that show a very bright set of colours. They are much duller than you'd expect. What IS for certain is there is NO BLACK (other than the name). 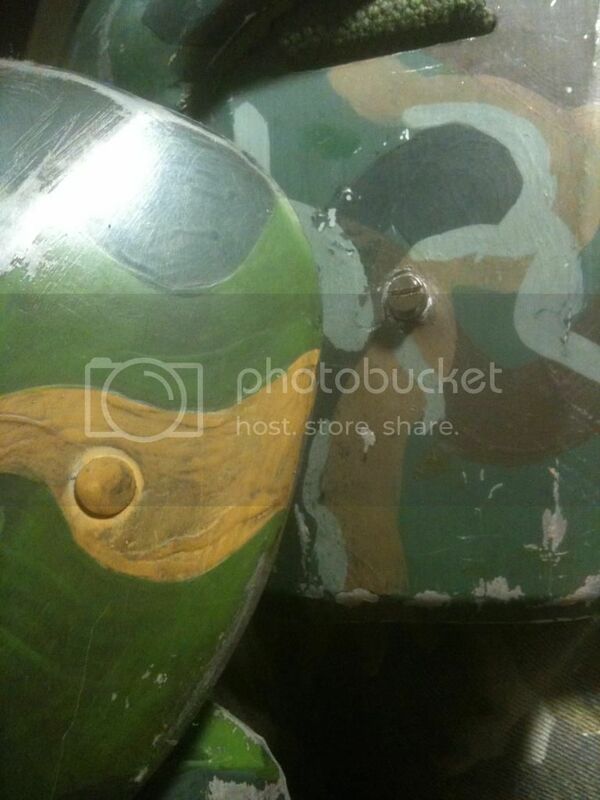 That's not to say that on differing sets of armour, there may have been different paints used. Case in point on this, is on Harry's "Hicks" armour, on the abdomen plate, there is a patch of the brown, that's clearly been painted with two different colours. It's as though they either ran out of one, or it needed touching up. So nothing is truly certain. Now we know that the polish that Terry used is no longer available, so I have used two different types of polish. One, an oil based type, and the other a graphite based version. The oil based version is more subtle and even. Whereas the graphite one can be much darker, almost black. So I think looking at Harry's, the polish was quite light. I went out and bought practically every paint in the greens/browns/greys range. (well, at least the ones they had). The Lighter Green is not as bright as the "ski" armour pictures, so not 80 (as shown on my armour above), and is likely to be either No 30 or No 78. I'm going to paint up a bit of the scheme in both, just to test. The Lighter Brown is quite dull... I think No 63 (sand) is too rich, and it's more likely to be No 93 (desert yellow) or No 94 (brown yellow). I would say No 94 is more favourite, because it's still reasonably rich. They grey is also quite dark. A bit nearer to No 106 (Ocean Grey) or No 140 (Gull Grey). 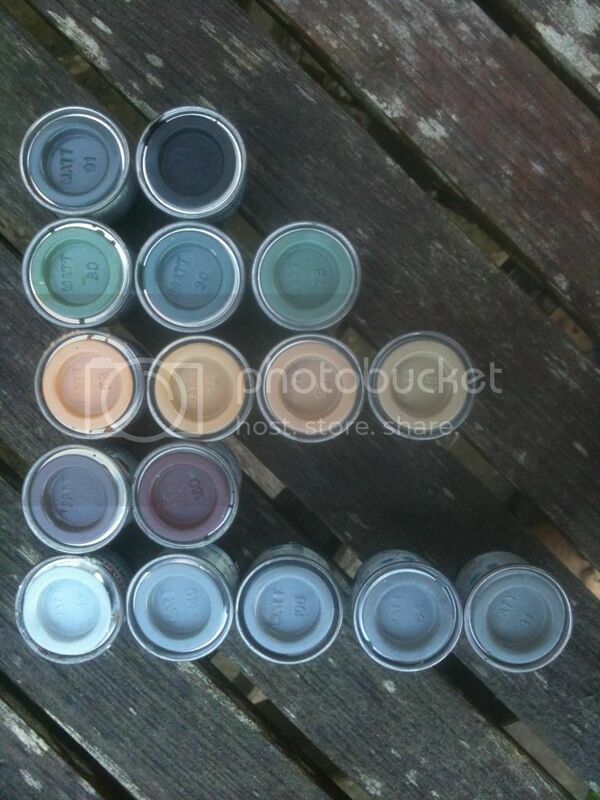 But looking at the Humbrol paint chart, No 28 (camouflage grey) and No 64 (Light Grey) are also contenders. That's about as much as I can offer at the moment. James got some better pictures than me. Feel free to debate away. sorry... Got Hicks on the brain... 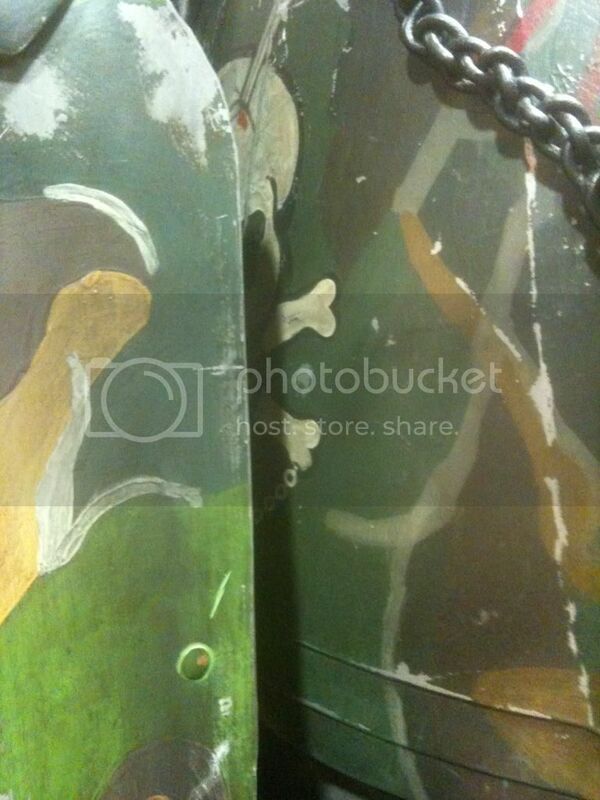 Looking at Dog Tags. Thank you for posting those. Looking forward to seeing how the swatch matching comes out. Interesting bit about the grey. And mildly surprised about the brown. I had thought the plain old brown (sorry don't have the number on hand) matched the pics better, but not having seen the real thing in person, I'll defer to your observations. Had my suspicions about the tan as well. Glad to see they were correct. Looking forward to seeing anything anyone else might have caught during the exhibition. Thanks again! I think to catergorically state it is this colour or it is that colour using today's humbrol range is difficult, all we can do is use what is close to what we see, humbrol used to have a massive range and now much of it is gone, as you can see from these old colour charts there were a lot of greens, browns, tans and greys, as well as a couple of diffirent types of black! this is also a cross reference chart to match other companies colours, you will notice brown bess is there and has a couple of matches!